GULF FRONT CONDO!! BOOK NOW FOR SPRING & SUMMER!! 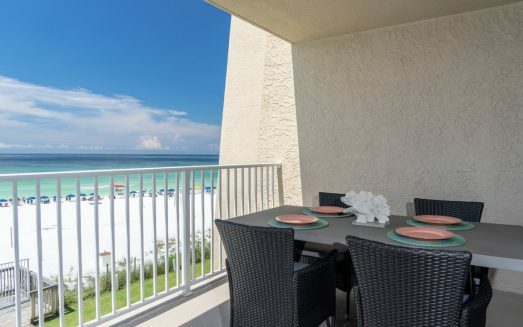 Unit #203 (second floor) is an ocean front condo with unobstructed views of the beautiful Destin beach! It has been completely remodeled and includes tile flooring throughout. Beautiful new granite counter tops in the kitchen with a vegetable/bar sink. New under-the-counter washer and dryer make it easy to launder those wet beach towels! The living area offers plenty of seating and a new 55′ HDTV and DVD player. The sliding door allows access to the balcony overlooking the beautiful ocean! The dining area is ample and will seat 6 comfortably. You can see the ocean from any view..the living area, dining or kitchen! The master bedroom has a king bed, ceiling fan, a 32′ TV and a private door to that wonderful balcony and the fabulous view of the ocean! The second bedroom has a queen bed, full bed, a TV with built-in DVD player and a private bath. There are tennis courts, a beautiful pool, shuffleboard and a gazebo with BBQ grills for outdoor cookouts. WE KEEP OUR CALENDAR UPDATED, SO PLEASE CHECK IT FOR AVAILABILITY BEFORE SENDING US AN E-MAIL, AND WE WILL RESPOND VIA EMAIL. THANK YOU!